A little something different for you this entry. This isn’t a blog or a list or any of my typical musings… this is a foray into fiction on my part. I am a writer, but of late, I find I don’t have nearly the time I would like to devote to works of fiction. But I would like to share some of what I do come up with with you. Ian Barth smelled the smoke, thick and pungent enough as it was to pull him from his sleep. His first thought was that his wife had left her straightener on and it had ignited one of their bathroom towels… she was always so concerned about that when they weren’t home. Ian couldn’t count the number of times his wife called him while she was at work, frantic that she had left that damn straightener on. He would stomp his way to their master bathroom and check the device, and every single time it was already off. Still, the fact that she had never actually left it on did not stop her from fretting about it at least once a week, causing him to have to step away from his desk to reassure her. So when he smelled the smoke, instantly his mind went to the hair tool; he was positive that she would one day leave it on purposefully just to show him that she wasn’t crazy. He opened his eyes, but the world around him was fuzzy and out of focus. There was a colorful flickering, but aside from that, all he saw was blackness hanging in the air around him. He shook his head to try to straighten out his vision, but just moving it caused a vicegrip of pain in his head. He moaned as he reached up to rub his temples as if he could massage the agony out; the inside of his skull felt tight and warm, and his eyesight refused to focus on the world around him. He coughed; invasive smoke was filling his lungs and his body was rebelling against it as best it could. Ian knew he needed to get out of bed and put out the fire before it engulfed the home. He leaned forward, but almost instantly bumped into something hard. It was not a painful impact, but the shock of hitting something where there should have been only air above his mattress sent him reeling back to a lying position. He removed his hand from his forehead and searched the area before him, and he found the same object his chest had just moments before. It was some kind of hard plastic, and as his hand roamed around, it found an edge where the plastic gave way to some sort of fabric. Memories started to ooze back to him, fighting their way through the fog in his mind. He was not at home in bed, no… he had left to go on a sales call that morning. He had said goodbye to Tiffany and gone before she went to work so that he could catch his flight out of Slateport Airport, so there was no way it was her straightener he was smelling. He wracked his brain to fill in the rest, and while doing so, he attempted to roll to his side only to find he was somehow strapped down. He felt the metal head of a seatbelt resting against his abdomen, and the reality of his last memories crashed hard into him. He remembered arriving at the airport, and the man in front of him at security who couldn’t figure out how to get his shoes off in a prompt fashion. He recalled getting on the plane and rolling his eyes at the safety demonstration he had seen a hundred times in his life on his sales trips. Then he was in the air, but there was turbulence, worse than he had ever felt before. They hit an airpocket and fell several feet, bringing the pilot onto the speaker system to give instructions, and then… he had a hint of a physical memory of his head colliding with the seatback in front of him. Then there was just darkness before the smoke roused him. As awareness returned to him, so did his vision. Smoke was filling the now upside-down cabin of his Rustboro Air flight, and sunlight was peeking through a large hole in the cabin not far from his seat. He looked around and saw several other passengers strewn about the interior of the plane; some were still belted to their seats, and others were loose in the aisle, but all of them were covered in blood. And they were motionless. He gripped the head of the seatbelt with his right hand and attempted to move his left to help unfasten it, but doing so only caused him to scream in agony as if some fierce creature had bitten down on his left arm. He looked over at his limb and recoiled at the sight of a jagged forearm bone protruding through his skin. He was barely able to turn his head in time to stop from vomiting all over the injury. His sick was tinged with blood, but the sight of it seemed also to empower him. He fought the fastener with his one capable hand and finally defeated it. Without the belt securing him, he toppled to his right as gravity pulled him not to the floor, but against the window next to his seat. His left arm and its exposed bone smacked an armrest as he tripped, and Ian was unable to stifle a violent scream at the impact. Using all the strength he could muster in his uninjured arm, he pushed himself upright and surveyed the cabin. The hole smashed through the side of the plane was allowing the deadly smoke to billow out, but it was also giving the flames around him access to oxygen. Ian knew he had to follow the soot’s lead and get out of the plane if he was to survive the next few minutes. He nudged the passenger next to him—a young man who had spent the entire flight with earphones in, even as the flight attendant insisted that all devices be powered off—in an attempt to rescue at least one other, but the young man’s head flopped heavily towards him. Vacant, bloody eyes showed Ian no signs of life. Shocked to his core by the sight, Ian was unable to choke down another bout of sickness and lost his retch all over the cracked window. He fought against the smoke to swallow a few deep breaths to regain his composure before he pulled himself with his one good arm over the seat in front of him to get closer to the hole. He turned to the gray-haired lady seated in front of him to try to rouse her, but the baseball-sized chunk of metal lodged in her neck alerted him that he would just be wasting his time. He lowered his head and shook it, but he knew he did not have time to grieve for these other travelers before the fire and smoke got to him. He used his good arm to pull his shirt collar over his nose and mouth and continued climbing towards the escape. By the time he made it to the hole through which he could climb, he had not found a single other passenger that had survived the crash. The tears welling in his eyes made it hard to see as he fought through the smoke that was also racing out to the world. It made visibility outside the hole impossible, and as Ian used his right arm to pull himself through, he only hoped to find fire trucks or ambulances or reporters… anybody gathered outside the tragedy who could get help. He tumbled out of the plane, doing his best to shield his left arm against his body, and was surprised to find his landing to be both soft and extraordinarily hot. The fierceness of the day’s sun fought against his eyes, and his forehead was sweating fiercely by the time his vision adjusted. The sky was a cloudless blue, framing a malevolently bright sun. The scenery around him was little more than rolling orange hills of sand. Ian’s body momentarily forgot to breathe as realization crept in—the plane had gone down over the VerdanMau Desert. Ian screamed out for help until his throat would offer up only coughing, but the desert was silent in return. He turned back to the plane and looked up at the hole; it was several feet up the smooth exterior of the plane, and with his broken arm, there was no way he could climb back inside and retrieve any water or food. He called to anyone inside the plane who may have survived the crash like he had, but there was no reply. As the cabin filled with fire and smoke, it seemed unlikely anyone inside who had not already escaped would be able to do so. The thought of the spreading fire stuck with him. Ian had no idea how long he’d been crashed before he woke up, but what if the fire was about to spread to the fuel tanks? The plane wreckage could be a time bomb, and he was sitting just inches from it. He struggled to his feet and plodded away through the sand; his legs were sore—he had definitely injured his right knee, at least—but they were at least in better shape than his arm, and he managed to amble several minutes away from the crash site before he stopped. The plane had not blown up yet, but he had no way to know the inevitability of such an event. Not only was the plane itself a possible threat, but if no one was aware that it went down where it did, help might never be on the way. Ian knew it was a long shot, but he determined his best chance was to start walking and hope to come across some kind of settlement or other sign of humanity. The desert scenery was indecipherable to Ian. Every slopping dune may as well have been identical as far as he could tell. The only standout feature seemed to be a quartet of cacti off in the distance, near the top of one slope of sand. Using them as his only landmark, Ian turned and began walking away from the crash. As he pushed forward, he checked back every few minutes to gauge the cacti and ensure he was walking in as much of a straight line as was possible. He had no idea how long it took, but after quite a while, he passed over a large dune, and the plane and the cacti were gone. He had only his trail in the sand left to try to keep himself going straight ahead. The sun was far too powerful for him to study its position in the sky—not that he trusted himself to be able to do such a thing; he was a traveling sales rep, not an astronomer—and its merciless assault on the exposed skin on his forearms and the top of his head was proving it to be much more foe than friend. It seemed at first like a mercy when the sun set over a distant dune several hours into the day and the winds picked up in its absence. At first, they were a gift from heaven as they cooled the desert air and provided some relief for his overheated body, but as their tenacity increased, they began whipping the desert sand through the air. Before the clouds of sand completely obscured Ian’s vision, he saw the fervent winds pushing and reshaping the desert mounds themselves, and it was all Ian could do to protect his eyes and the gaping wound on his arm. He knew the last thing he needed was to get an infection there. Ian’s body was ravaged by the sandstorm, and with no visibility left at all, he knew he needed to surrender for the night. He dropped to his knees and dug at the sand as hard as he could with his working arm. Progress was slow; it seemed like as much sand as he could push aside was almost instantly replaced by the storm. The muscles in his arm burned in anger as he pushed sand harder and faster in a desperate race to get away from the storm until he finally dug out a spot his body might fit into. He pulled off his t-shirt, wrapped it around the exposed bone and gouge in his forearm, and rolled into the ditch. Spending the night in a self-dug ditch and covered in a comforter of sand was not quite the same as the room he had booked at the Winstrate Hotel in Sootopolis City for that evening, but there was a little part of his brain that wouldn’t let him forget that it was certainly better than burning up in plane wreckage. He rolled around in the sand in the futility of trying to find comfort, and spent the night hoping he would have a chance to see Tiffany again. By the time the sun rose and the sounds of wind had died down, Ian had no idea how much he had actually slept. He had awakened several times throughout the night either in virulent pain because he rolled onto his broken arm or because the howling wind made it impossible to sleep. But given that it was daylight again, he knew he had to dig out and continue trying to find safety rather than try to get more rest. He poked out of his makeshift bed and tried to get his sense of direction. The sandstorm had obliterated whatever tracks he may have made the day before. He started glancing around in the hopes of getting a sense of where he had been going, and that was when he saw them. The four cacti were there. Not only had he not made it away from them, but if anything, they were several yards closer than they were the day before. Ian cursed himself for having gotten lost in the blazing sun and subsequent sandstorm. He thought himself a fool for having ended where he started, but it was then that he realized the crashed plane was nowhere to be found. His head darted about trying to find a sign of it, but there was none. Had it exploded? Had the sandstorm swallowed it up? How could it be gone if he had wandered back to where he came from? Ian shook his head and wondered if it wasn’t the likely concussion playing tricks on him. He must have seen a different quartet of cacti the previous day, and these ones, similar as they seemed, were just a new set he had passed the previous evening when he couldn’t see anything. Whatever the reason for their presence, it was all a distraction. Without shelter and water, he was as good as dead. Cacti or no. He gingerly removed the wrapped shirt from around his arm and pulled it back over his exposed torso. The arm looked worse than yesterday; the skin around the wound was turning an eggplant shade, and the exposed bone looked like it had been rubbed with sandpaper after the windstorm. He lightly touched it with his good hand and found that most of the feeling in it was gone; he knew that was not at all the blessing that it seemed. Every hour he spent in the desert diminished whatever chance there was left that he could save his limb. As with the day before, he decided to walk away from the cacti to try to keep himself in line. As the second day passed, Ian felt his throat burning up between the lack of moisture and whatever sand he may have accidentally swallowed. His dry, swollen tongue was starting to stick to the inside of his mouth if he didn’t move it frequently, and even his eyeballs felt as if they were drying out. Each time he neared the top of a sandhill, he prayed that he would see civilization on the other side. And each time, he was crushed a little bit more when all that was there was another outreach of desert. Having learned a lesson from his first night in the desert, before the sun had set and the winds had a chance to batter him, Ian began preparing a shelter for the night. It was easier to dig without the sand whipping about, but he could feel his strength leaving him, and it still took several minutes to unearth a worthy ditch to protect him. He heard the winds pick up after he was settled in and thought about how he may never see his wife again. The next day, Ian barely had the will to move. He was too busy staring at the four cacti. They stood just a few dozen yards from where he had awoken. There was still no sight of the plane wreckage, and since he had begun to rest for the night before the sun went down, he knew they weren’t there the previous day. He thought he noticed one of them move slightly, but immediately wrote it off; he had always imagined that desert mirages were just something from childhood cartoons—not unlike quicksand or falling anvils—but the omnipresent cacti had convinced him otherwise. He wanted to shout at them; to let them know that he knew they were just a figment of his imagination trying to defeat his will to live, but he found he didn’t have the strength even for that. The third day progressed much like the second, only more slowly. The pain in Ian’s right knee assaulted him with every unsteady step he made in the sand, and his dehydrated body had little strength left for another all-day push. Ian’s dry gasps scraped his battered throat. Each passing dune that showed only more outstretched desert beyond was met with less disappointment and despair and more realized expectations. With hours to go still before the sun was fully set, Ian knew he needed to stop. The travel was taking too much out of him. He fell forward to his knees and began slowly pushing away enough sand to rest in. He promised himself he would get enough sleep that night to be fully rested for the next day so he could journey on for longer. He vowed that after a good night’s sleep, he would refuse to stop until he found signs of life. Just a few feet behind Ian, the four cactus creatures watched him make his bed for the night. Their heads turned, and with hungry yellow eyes, communicated what they each already knew. This stranger in their home was far too weak by this point to mount any resistance. He would be theirs that night. Ian Barth’s body was not recovered with the wreckage of Rustboro Air flight eight-thirty-two. He was never heard from again. 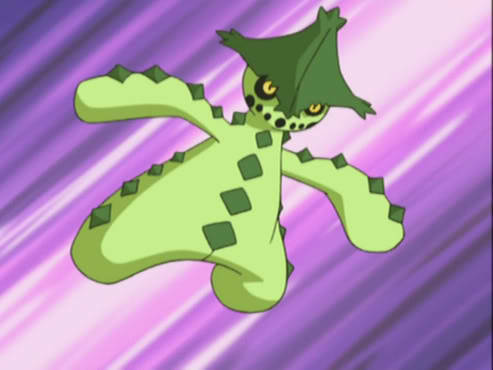 Cacturne: Packs of them follow travelers through the desert until the travelers can no longer move.